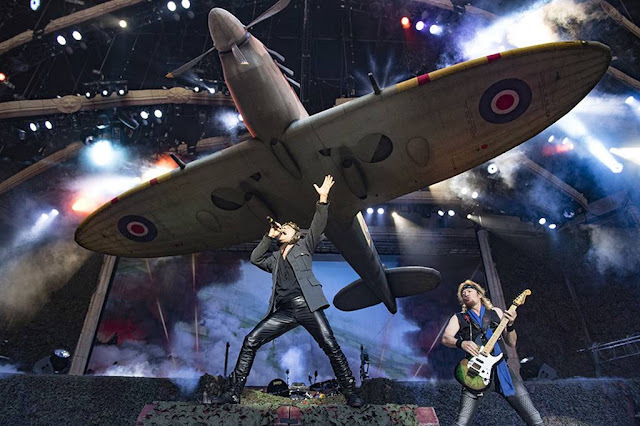 Iron Maiden fly replica Spitfire during "Legacy of the Beast Tour" in UK. Says singer Bruce Dickinson: "We would have made it actual size, but we had to cut it down by 10 percent to fit on some of the festival stages. Otherwise, it's an exact replica of arguably the greatest plane design ever — in fact, one of the best-designed machines ever!" Launching the show with crowd favorite "Aces High", the Spitfire is seen propelling above the stage. This is not the first time that a warbird is part of a Maiden' show. Four years ago the vocalist and pilot Bruce Dickinson took to the air in a World War I–era fighter plane to perform a 12-minute dogfight over metal fans’ heads during the Sonisphere festival, UK. He put on the show with the Great War Display Team, of which he is a member, as a way to commemorate the 100th anniversary of the First World War.